A father-of-three has ascended the highest mountain in south Wales for the 365th time in a year. 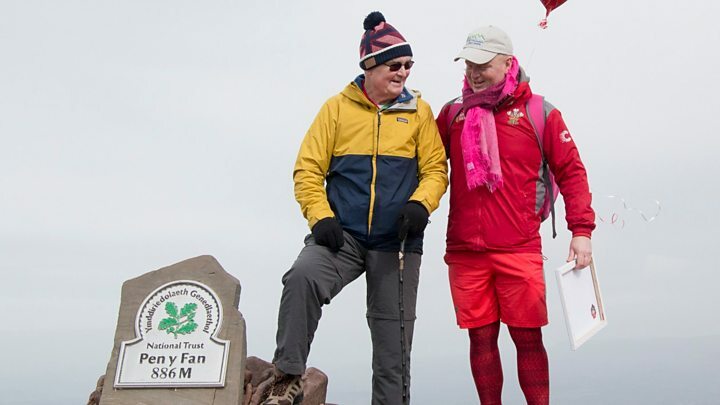 Des Lally, 43, a mortgage broker from Brecon, has been walking up and down Pen y Fan in the Brecon Beacons on most days for the last year. He has braved blizzards, 5ft (1.5m) snow drifts, 80mph winds and countless torrential downpours in aid of charity. An emotional Mr Lally said he had a "tear in my eye" as he reached the summit alongside his father, 76. Heat exhaustion last summer left Mr Lally facing a number of ascents each day to make up lost time, including three on Friday. "Today is the end of a long year," he said at the summit. "It's been really humbling - not only the people who have donated, but the people who have liked and shared it. He has raised more than £50,000 for Help for Heroes, a charity which helps injured or unwell former military personnel, and Cancer Research UK. Mr Lally said both charities meant a lot to him after both his parents have been affected by cancer. His father Des Lally Snr served for 26 years with the Irish Guards in Germany, Hong Kong, Singapore, Malaysia, Belize and Canada before retiring in Brecon in the 1980s. "I'm not an emotional guy but there was a tear in my eye - it was an emotional time," said Mr Lally. He has faced numerous challenges along the way; from the searing heat and biting cold, to injured ankles and twisted knees. "When you are turning up at nine at night and it's dark, there are 70-80mph winds, it's smashing down with rain, you are on your own and I think 'here we go again'," he said. "But you have only got to think about the reasons you are doing it and you are soon out of the car and on the way."